From the 1970s through the 1990s, acid rain was the main environmental concern. Lakes1, vegetation2 and animals3 were affected. Acid rain simply refers to rain or other precipitants that have uncommonly high acidity. This is a result of SO2 in the air that dissolves in water creating sulfuric acid. The source of this SO2 is largely power plants that burn fossil fuels. The EPA, under the 1990 Clean Air Act amendments, created the Acid Rain Program (ARP). The aim was to reduce the amount of NO2 and SO2 emissions, while allowing for the industry to employ cost-effective technology to achieve this goal. As the following graph shows, the program was a remarkable success. Flue gas desulfurization units are used to remove SO2 from flue gas; the process is also called scrubbing. The most common type is limestone scrubbing, in which the flue gas is stripped by dissolution into water. The stripped gas reacts with the limestone (CaCO3) resulting in solid residue, in this case calcium sulfite (CaSO3). The scrubbing efficiency is usually higher than 90%. To achieve this level of efficiency, the concentration of SO2 must be monitored both before and after the process. The OMA-300 measures a full, high-resolution spectrum. This allows for both applications to be monitored continuously by the same analyzer, from 4000 ppm to 10 ppm full scale. Hence, it provides an indication of the process’ effectiveness by measuring the SO2 before and after the flue gas desulfurization unit. 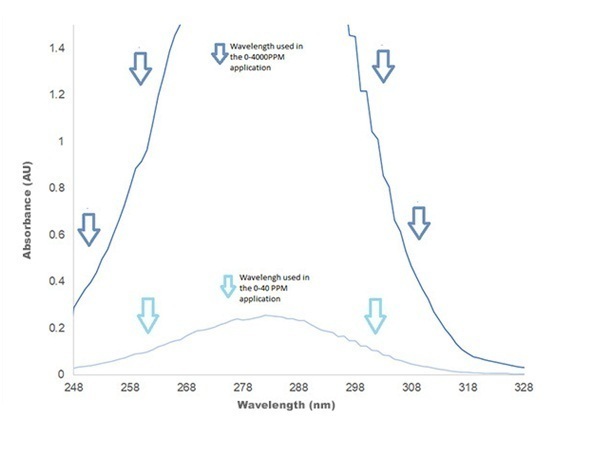 Figure 3: Absorbance spectra of SO2 40 ppm and 4000 ppm, demonstrating that one analyzer can be used for both applications simultaneously. The absorbances at different wavelengths are correlated to the SO2 concentration. 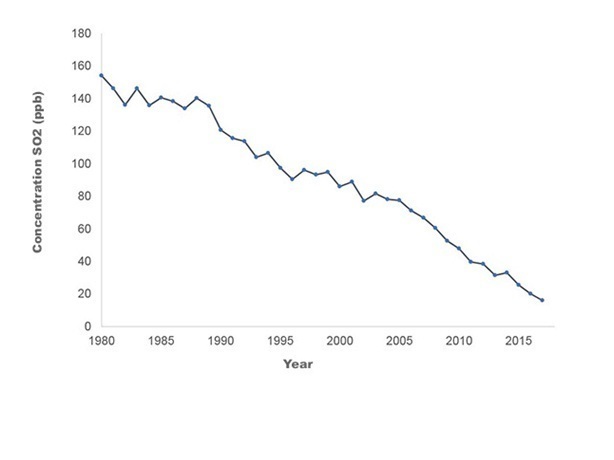 While controlling industrial SO2 emission in North America and Western Europe has been largely successful, acid rain is still a problem in rapidly growing economies such as China and India. Even the famous Taj Mahal in Agra is facing corrosion of its marble9. Hopefully, in the very near future, these burgeoning regions will implement the same technology and regulations that worked so well in more established countries. 1. WILLIAM K. STEVENSJAN , ‘Study of Acid Rain Uncovers a Threat To Far Wider Area’, New York times, 16, 1990. 2. WILLIAM K. STEVENSAPRIL, ‘The Forest That Stopped Growing: Trail Is Traced to Acid Rain’ New York Times, 16, 1996 . 3. LES LINEMARCH ‘Acid Rain Leading to Moose Deaths’ , New York Times, 12, 1996. 4. (BAYARD WEBSTERNOV. “Acid Rain: An Increasing Threat” New York Times 6,11, 1979).